Just like vCard aka VCF, CSV is also a common format used to store contact information such as name, address, phone number, etc. However, when you try to import CSV contacts to iPhone, instead of importing the CSV file directly, you need to convert it to vCard format which is supported by iPhone. The good news is there are actually easier ways to do the importing on both Mac and Windows. These methods are useful regardless of iPhone generations such as iPhone X, iPhone 8, iPhone 7, iPhone 6S or the 2018 models. You can use Cisdem ContactsMate to effectively import contacts from CSV file to iPhone with the above benefits and to perform other contact-related tasks. You can find the step-by-step instructions below. Please note that this contact management app only works on Mac. PC users can check out the three other methods provided in this article. 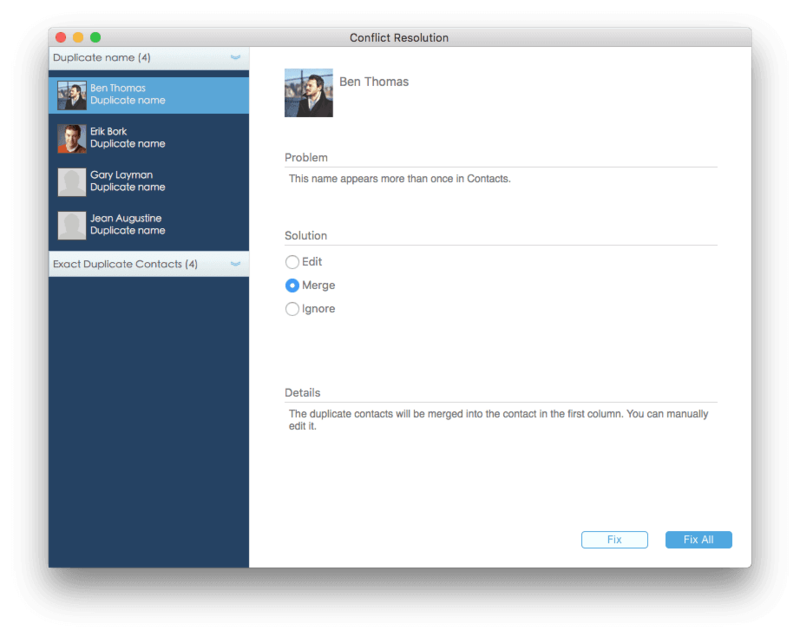 Download and install Cisdem ContactsMate on your Mac. Upon first opening it, you will see a dialog box asking for the permission to access the Contacts app on your Mac. Click OK. Step 1. Get contacts to sync between iPhone and iCloud. If you have already done so previously, just ignore this step. If not, tap Settings and tap your name at the top of the screen of your iPhone. Tap iCloud. Switch on the Contacts option. Step 2. Launch Cisdem ContactsMate. From the menu bar, click Add Account. The Internet Accounts window will appear. Add your iCloud account by clicking the iCloud option from the list and signing into it and then select the checkbox before Contacts. Close the Internet Accounts window. Step 3. On the left side panel of the ContactsMate interface, you will find the group iCloud under which your iCloud/iPhone contacts are listed. Click the group iCloud and then click Import from the menu bar. Select the CSV file from which you want to import contacts to iPhone. Click Open. After your iPhone finishes syncing contacts from iCloud, you will find the imported CSV contacts on your iPhone. It’s that easy! If, before you import CSV contacts to iPhone, some contacts from the CSV file already exist on your iPhone, the importing will result in duplicate contacts. In a case like this, Cisdem ContactsMate can be helpful. After you finish Step 3, let the group iCloud stay selected and click Scan on the menu bar. The Conflict Resolution dialog box will show up, listing the found duplicate contacts and providing multiple solutions with guidance. You can also use this app to fix formatting issues. From the menu bar on the top of the screen on your Mac, select Cisdem ContactsMate Preferences. In the dialog box, make changes according to your need. From the menu bar of ContactsMate, click Scan to look for and fix issues. You can also import contacts to iPhone from an Excel file by using the same app and steps, but you need to convert the Excel file to CSV first. You can do the converting easily in Microsoft Excel or using online tools such as Zamzar. Import contacts to Mac from CSV, VCF, and sync contacts from Google, iCloud, Twitter, etc. Another way to import CSV contacts to iPhone without iTunes is to use Gmail/Google Contacts. Below is how. Step 1. Import CSV contacts to Gmail. 1. Sign into your Google account and go to contacts.google.com. 2. Find the More dropdown list and click Import. Click Select file and select the CSV file that contains the contacts you want to import to iPhone. Click Open. Click Import. The imported CSV contacts will be labeled by the import date. Step 2. Sync Gmail contacts to iPhone. 1. Select the contacts you’ve just imported. The labeling feature can be helpful. 2. Click Import under More. 3. In the Export contacts dialog box, select vCard, and click Export. Save the exported file on your computer. 4. Sign into icloud.com using your Apple ID account and password. Click Contacts. 5. In the bottom left corner, click the gear-like icon. Click Import vCard. 6. Select the vCard file you’ve just saved. Click Open. After syncing the iCloud contacts to your iPhone, you should be able to find the imported CSV contacts in your iPhone’s Contacts app. 1. Go to Settings. Select Contacts > Accounts > Add Account. 2. Tap Google. Sign into your Google account. 3. Switch on the Contacts option. With the older iOS version such as iOS 9, the steps are very similar. You can set up by going to Settings > Mail, Contacts, Calendar > Add Account. You can also import contacts from CSV file to iPhone without iTunes by using Outlook. Step 1. Go to outlook.live.com/people. Sign in using your Outlook or Hotmail email and password. Step 2. From the toolbar on the top, select Manage > Import contacts. For the sake of convenience, before importing, you can create a new folder for the CSV contacts under Folders. Step 3. Click Browse. In the Export contacts dialog box, select vCard, and click Export. Select the CSV file from which you need to import contacts to your iPhone. Click Open. Click Import. Step 4. If you receive the “Something went wrong” error message, you need to convert your CSV file to Outlook CSV format. In this case, download this sample CSV file and copy the contacts from your own file. Save it. If you have no problems importing your file, just ignore this step. Step 5. Once the file is loaded up, the CSV contacts are imported to Outlook. Step 6. Set up Outlook contacts on your iPhone. To do this, open Settings on your iPhone, go to Contacts > Accounts > Add Account. Tap on Outlook.com and sign into it. Enable Contacts. Tap Save. You should find the CSV contacts imported to your iPhone. The three methods above allow you to import CSV contacts to iPhone without iTunes. This part will show you how to do the importing with iTunes. But with this method, you need to import contacts from CSV file to Gmail/Google Contacts or Outlook first. Here Outlook is taken as an example. Step 1. Import CSV contacts to Outlook. Step 2. Plug your iPhone into a Mac or PC with iTunes installed. iTunes will automatically open. If it doesn’t, launch it on your computer. Step 3. iTunes will detect your phone. Select the phone and click Info in the left side panel. Step 4. Select Sync Contacts with > Outlook. You can choose to sync all contacts or select group(s). If you are a Mac user, you can easily import CSV contacts to iPhone in three simple steps using Cisdem ContactsMate. You can also import the contacts to iPhone wirelessly using Gmail or Outlook or do it via iTunes. ContactsMate, iCloud, Gmail and other tools mentioned in this article can also be used for other contacts syncing or transferring scenarios such as transferring contacts from Android to computer. How to Import Contacts into Outlook? We can store our contacts through many channels, like iPhone, mac and some media applications. With my situation, I prefer to manage all of my contacts at one place, it will be very easy to call, message or email someone. In order to make email be convenient, this article will introduce how to import contacts into outlook. Communication becomes more convenient through phone, message, Facebook, What’s App, Twitter, etc, but after we merge them at one place, there are so many duplicate contacts. In this tutorial, I will introduce some ways about how to delete duplicate contacts on iPhone, android and mac by the system itself or some contact management software. Many times, we are likely to repeat storing contacts of some people. 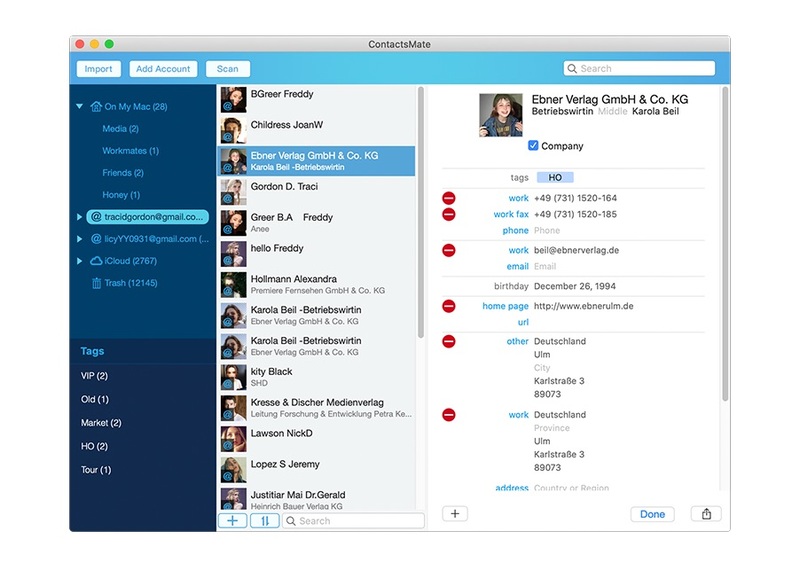 Plenty of duplicate contacts caused a lot of inconvenience for contact management. So what we should to do to deal with those tiresome duplicate contacts? Merging duplicate contacts seems a good solution to this troublesome problem.